So, I noticed on Tuesday afternoon that Pearl had watery poops. Initially I thought it could be dietary related, as she had just eaten vegetables. However, on Wednesday morning her stool was still watery. She was behaving normally, preening, flying, playing, and had a clean vent, but I don’t take any chances. I immediately called my vet to find out if they could squeeze her in (it’s a busy practice), and I made an additional appointment for my two other birds on Thursday (today), since they all live together and I am concerned that they may all be sick. The vet did some investigations, and discovered that her crop was filled with bacteria. She believes that she ate something that caused the bacterial infection, and irritated her digestive system. I have no idea what, but I emptied and cleaned all of their bowls as soon as I got home, as well as cleaning the cage. She decided it would be best for me to give Pearl her medicine with a small syringe orally instead of putting it in her water, as budgies don’t always drink lots of water. I’m really clumsy at giving Pearl her medicine, so today I am going to ask her to show me again how to do it correctly! I am really hoping my other two birds are okay. They are a very close flock, they are always together. So either they could have eaten the same thing that Pearl did to make her sick, or they could have caught it from her. Again, I have no idea what it could have been, I am so careful with their environment. If it comes back that all three are sick, what would be the best plan in making their living space appropriate to ensure recovery? Should I throw away all their toys, or would washing them be enough? All three are still very active, eating, preening, flying, playing, but I am still worried. Nevertheless, I think I’ve caught this illness fast enough. Last edited by reeb; 12-06-2018 at 04:31 AM. Oh, reeb! I'm so sorry. I'm thrilled you gt right on this and got vet input. You know, I'd ask the vet those excellent questions about managing things while everything settles. Please keep us posted. I can only imagine how worried you are!!!!!!!!!!!!!!!!!!!! Most people I know would not have been this proactive in getting the bird to a CAV almost immediately. Good luck with the meds- it can be a bit tricky, but once you get the hang of it... no problem. You did do a great job of catching this quickly! Did they culture the crop bacteria, so you know what it is? Just take your time and ask for he vet plunty of questions, you can write them down before if you need to. I can't imagine giving meds to my budgies that has to be so hard!!! Do you keep tract if the weights? That might become important while you treat. Budgies are prone to that mega bacterial (some thought is it's s type of yeast) it is hard to get rid of , and can lead to chronic weight loss, so ask questions when you see the vet. Hopefully everyone else is fine. Glad you caught this early and are treating Pearl. Because they are so close, wonder if the vet will allow you to prophylactically treat the others - either immediately or when they become symptomatic? Update! And an extra little story. Wow, the past couple of days have been hectic!! So I got worried as the day went on because Berry started having som squishy poop, something that isn’t normal for her. So I was definitely happy to have the appointment this afternoon. The vet showed me a better method of giving Pearl the meds, so that should go a little more smoothly. She did mention yesterday that there wasn’t yeast. I can’t remember which bacteria it was specifically, but she’s given me the appropriate antibiotics for 5 days. She did a physical exam of the other two, and said that they both seem fine. 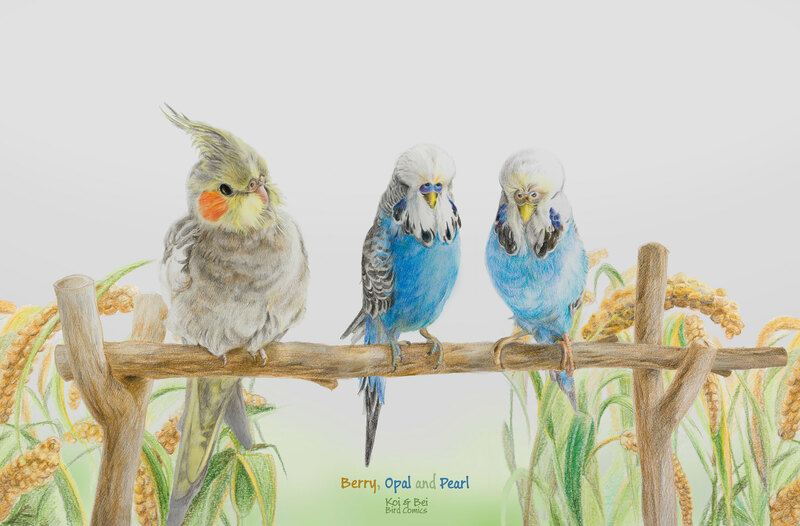 Opal’s poop is totally normal, but I showed her Berry’s and she agreed that it wasn’t as it usually is. However, she wasn’t too worried about it, because Berry seems so healthy otherwise, and her stool was nowhere near as watery as Pearl’s. She said that she could do another crop needle with her to have a look at what is going on in her crop, just as she did with Pearl, however she said it would likely be the same thing since they live together. She gave her a shot of Vitamin B, told me to keep an eye on her, and to let her know if she doesn’t improve, then we can act from there. All three weigh okay, and Pearl has actually gained back the gram she lost, which is good. I am very grateful to have such a thorough vet! Then, the drama continued as I got home, and Berry (quite literally) dropped her first egg. I have NO IDEA why she laid an egg, their environment doesn’t encourage it, maybe because it’s summer here? They don’t have nesting places, they have a consistent schedule, longer nights and shorter days... I don’t even know.... I was worried that this day might come. I will probably start another thread to ask advice on egg laying, because I know how some cockatiels can just lay and lay and lay and get egg bound. The egg had a really healthy shell, which is always good to see, since it means that she is getting a good amount of calcium. I’ll add more of that to her diet over the next little bit. I REALLY hope this is the only egg she lays. Hey, it had to happen one day, right? BUT, this is also good news, because it means her poo wasn’t squishy because she’s sick, but instead because she was about to lay an egg. I have bred budgies before, so I know all about such things haha. Oh gosh, I’m a wreck now. definitely going to crash soon, and it’s only 7pm here. Last edited by reeb; 12-06-2018 at 01:52 PM. Take a deep breath...you're doing fine. First on the Budgies with the Bacterial Infection...NEVER give your birds, any of them, ANYTHING in their drinking water, not medication, not vitamins or any other supplements, nothing!!! First of all you have no idea what dosage they are getting if you put it in their water, and more importantly it immediately contaminates their water and starts growing both Bacteria and Fungi, which can make them even more ill. So ALWAYS given them oral medications directly into their beaks/mouths. they end-up developing a Fungal/Yeast infection in their GI Tract that is actually caused by the Antibiotic...Probiotics are strains of those "good" Bacteria that the antibiotics kill-off, so any time you give them an Antibiotic for anything, it's a really good idea to also give them a daily Probiotic supplement for the entire time they are on the Antibiotic, and then also for at least a week after they finish the antibiotic, just to make sure they don't develop a Fungal/Yeast infection at the same time...Yeast is actually a Fungi, not a Bacteria... Any Petco sells a bottle of powdered Avian Probiotics made by a company called "Qwiko", it's called "Qwiko Avian Probiotics". It costs $10, and it comes with a tiny scoop inside the bottle that you simply fill with the powdered Probiotic, and then sprinkle the small amount of powder onto the top of their seeds once a day, that's it. It will keep any Yeast/Fungus from growing inside of the GI Tracts, and it will also help to keep their GI Tracts feeling settled. As far as where the Bacterial Infection came from in the first place, it's difficult to know, It's a really good idea to completely clean all of their cages, bowls, toys, and play-stands with bleach and really hot water, then rinse them really, really well until you can no-longer smell the bleach any longer. As far as toys go, if they are plastic you can wash them with the bleach and hot water...but if they are wooden, it's tough because they are porous, so it's a judgement call whether you want to wash them and re-use them or not. Make sure that she always has access to both a CuttleBone and a Mineral Block for Calcium and Phosphorous. Lots of dark, leafy greens and veggies as well. You can even give some Egg-Food while she's laying her eggs, which is also made by Qwiko and sold at any Petco, right next to the Probiotics. etc. inside of her cage to put the eggs in/on, nor do you want to put a nest-box in her cage. Just allow the eggs that she lays to remain on the bottom of the cage. She may or may not lay more, if she does it will probably happen every other day. Once she lays at least 2 eggs, she will probably start laying on them, if she's not already laying on just the one egg (sometimes they will, but usually they wait until there are at least 2-3 eggs to start laying on them)...So it's important that she is allowed to lay on the eggs on the bottom of her cage for as long as she wants to. Eventually she will realize that they are not going to hatch, she'll lose interest in them, and she'll stop laying on them. Once that happens you can remove all of the eggs and throw them away. Allowing her to lay on her eggs until she loses interest will help to deter her from laying another clutch right away after this one...If you simply remove each egg she lays and throw them away without allowing her to lay on them as a clutch, that usually results in them laying more and more eggs. Do you have any cheap toys in your cage? Any sort of metal? My budgie went in recently for sort of the same thing- because he wasn't eating and had strange stool, the vet said she thinks the bacteria in his crop interrupted his digestion and caused that. Her main suspicion was any sort of exposed metal, such as cheap bells that were losing their finish. She also had me check the cage for any spots it may be losing its finish as well. I haven't had any issue since I removed the bells and replace them with stainless steel ones. The vet has prescribed probiotics along with the antibiotics, so don’t worry, little Pearl is covered on that front! I have cleaned everything at this point, except their toys. I still have to decide which ones I’m going to either wash/keep or just throw away. It’s odd, my birds prefer playing with the toys I make for them, so a lot of the toys they have barely get played with. I’m going to redesign the cage and everything tomorrow morning most likely. In terms of Berry, yes, she is a single female cockatiel. This is her first egg, and she has no idea what she’s doing so she laid it from the highest perch in the cage so it broke haha. I am readjusting their daylight hours, that is the only environmental thing that has changed recently. If she lays another egg, I will probably do what you suggested and boil and leave them at the bottom of the cage with no nesting materials. I’ve always been TERRIFIED of her potentially laying eggs, because I know how scary it can be if they lay and lay and lay. I’ve got their diets covered, they get a very balanced diet. She also has access to mineral blocks and cuttlefish on both her playgym and in the cage. Also, spinach is her favourite food, so I’ll give her extra during this time! The egg she laid (although it broke due to gravity), had a nice shell, so I think she has been getting an adequate diet with regards to calcium etc. Starting from tonight we are going back to having less daylight hours. I will definitely send you a personal message if I need more help with her! Thank you for taking the time to write this all out! I really appreciate it. Last edited by reeb; 12-07-2018 at 12:00 AM. Thanks for the advice! I’ll be looking at the toys and what not tomorrow!